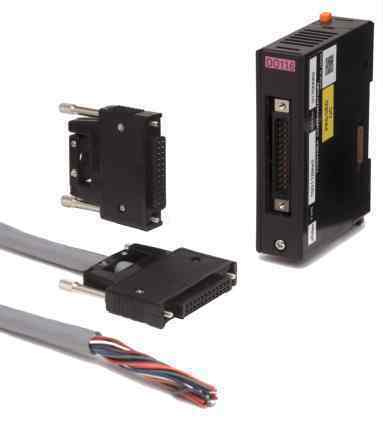 Cable for T1 Discrete I/O Modules or T2 Hi Density (32 Pt) I/O Modules, 2m, One end I/O connector other end pigtail. This cable is used with several cards to provide a low labor way of adding high density expansion. The connector plugs into the card and the other end is a pigtail - that is a bundle of lose wires that can be landed to terminal strips etc. Also available for these connectors are the TPT15F-AS which can crimp onto a ribbon cable and the TPT15S-AS which provides solder cups. The above picture shows a module with a high density connector. To its left is a EX10-ANC32 solder cup connector and below are both ends of the EX10-KIO20. There is also a TPT15-AS connector (not shown) that crimps on to the end of a ribbon cable.